Midtown Neighborhood Plan - Stalled or Stopped? FixBuffalo readers may remember a five part series of posts - Neighborhood Plan - from this past Spring where I first started asking a number of questions about a $12m scatter-shot-rent-to-own neighborhood development plan that was scheduled for this Midtown neighborhood. Artvoice picked up on it - here. The Buffalo News carried a front page article about this development today - right here. At the center of the storm is Rev. Richard Stenhouse in what the Buffalo News has called a 'pay-to-play' mentality about this $12m development. Rev. Stenhouse is no stranger to controversy surrounding housing issues here in Cold Springs. Two years ago, as the City's Control Board secretary/treasurer and Executive Director of Bethel CDC he was involved in a number of Housing Court cases involving Bethel's ownership of four violation ridden houses on Michigan Avenue, directly across the street from one of the City's recently renovated schools, Performing Arts HS. Here's that story. Earlier this evening I visited Ada Place and talked to a number of residents, folks who've owned homes on one of Cold Springs most challenged streets, with one of the most amazing compact streetscapes in the City. They quickly pointed to 38 Ada Place - covered here, last March and first, three years ago here - a single family home still owned by Rev. Stenhouse's Bethel CDC. Residential development here should be concentrated and strategic, not scattered. It should respect good planning and urban design principles. This plan didn't and shouldn't have gotten as far as it did. There's a strong case to be made for re-hab financing and/or a revolving low-interest loan fund, for area residents to access for all sorts of deferred maintenance on homes here in Midtown's struggling, architecturally and historically rich neighborhoods. The $12m that had been earmarked for 50 new-builds and a club house on Michigan Avenue (that's right - here), needs to be urgently redirected. A number of very astute people, long involved in housing policy in this 'shrinking city' that I spoke with late Monday afternoon, weren't so much shocked by the revelations that appeared in today's B/N article as they were relieved. As one told me today - "today more people will finally see that the 'strong-arm' practices, so reminiscent of third-world political hacks and thugs have finally come to the surface in Buffalo - a city that now really resembles a 'failed-state'. Strong language. This should be interesting, watching this one un-wind. 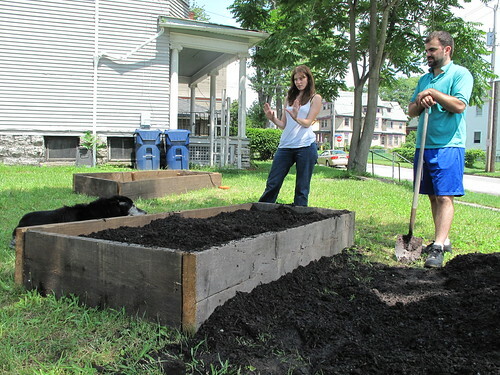 Behind Artspace on Ellicott is the City's newest raised bed community garden project. When I stopped by this afternoon, Amanda and Colleen we're busy with a number of other Artspace residents filling the raised beds with compost. They've been working on the project all year and with the cooperation of Artspace who bought the land and Buffalo Re-Use - raised beds and compost, they're planning on a bountiful crop of herbs and vegetables. 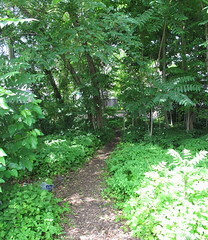 Amanda showed me the garden path she's created linking Artspace with the neighborhood, the sort of linkages that I always imagined that would be established between Artspace and the community. Colleen is putting together a 'work-day' schedule for this project and she can be reached at colleenthinks@gmail.com for more information. Topping a list of needs for the project is a garden shed. So, if any fixBuffalo readers have or know of garden shed that's available, please contact Colleen. This afternoon the City's Preservation Board unanimously approved the demolition plan for a number of buildings on the site of the former German Roman Catholic Orphan Home at the end of Dodge Street. The three iconic structures - two dormitory towers and the chapel - will be incorporated into the new St. Martin Village, a 60 unit housing development. Gary Bichler - R&P Oak Hill Development - and Philip Silvestri - Silvestri Architects - were both on hand to describe the exciting news for the neighborhood and answer a number of questions from Preservation Board members. 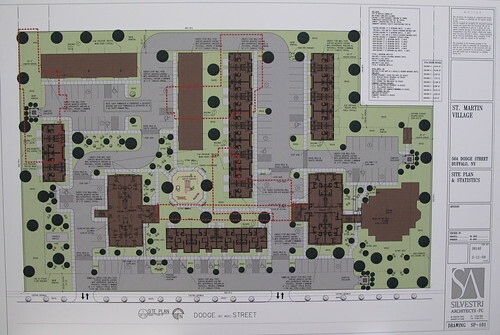 While final details of the site's parking arrangements drove most of the conversation, everyone present embraced the $15m project. According to Gary, the construction documents are scheduled for a November closing. I asked him about site security - see photo archive - and he promised that once the project closes, the site will be secured. The project will create 36 new townhouses and 24 apartments in the former dormitory towers. Belmont Management will be the site manager and after a period of 15 years, tenants can purchase their residences. Yesterday, I spent about an hour walking the site. Doors to all the buildings were still wide open, like they've been for the past four years. Here some pics. Three years ago, Sean Galbraith one of continent's leading urban photographers, created the following site map. 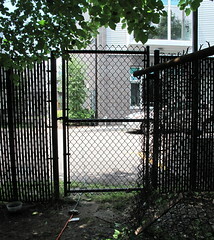 It was used in the DK Photo Group's Toronto based show, Orphaned in 2006. This 1915 map shows what's been lost/gained over the years. Here's a link to a number of posts from years past. Very cool development here in the neighborhood and all things considered, a thoughtful reuse of one of the City's most neglected heritage properties. I'll be tracking progress in the coming months. Correction (7/27/09 - 5pm): I wrote last week that Belmont Shelter would be involved in the management of St. Martin's, I was wrong. A different agency, Belmont Management will be doing this. I apologize for the confusion that this may have caused. This showed up in my email this morning as the story of the week from Preservation Nation. It's a fascinating six minute short about the intersection of abandonment, architecture and video in telling stories about places that are being demolished and disappearing from memory in the Queen City. The opening shot includes a view of 98 Laurel Street, a small defiant place that still stands as of this morning in Buffalo's Cold Springs neighborhood. Perhaps only a movie can capture the plight of the 1920s bungalows in Buffalo, N.Y., that are being torn down to make way for McMansions. In a six-minute film, a camera moves inside several of the doomed houses as workers tear them apart. Filmmaker Billy Erhard tracks across walls, peers through holes in ceilings and floors, and travels upstairs and onto roofs. Jittery home movies flash against one house's half-razed walls, accompanied by the sound of hammering. This was film maker Billy Erhard's entry - 'Urban Disintegration' - in a short film contest sponsored by the Los Angeles based Society for Moving Images about the Built Environment, SMIBE. SMIBE tries to collect films that touch on this notion of recording or "preserving," space visually. Indeed, several competition entries focused on abandoned, blighted, or environmentally damaged structures or areas - read the rest. Preservation Nation is the on-line magazine and official site for the National Trust for Historic Preservation, the same organization that has chosen Buffalo, NY for its annual conference in 2011 - details here. Blogging will be light and probably sporadic for the rest of the summer. I'll be posting on a more regular routine in the Fall. 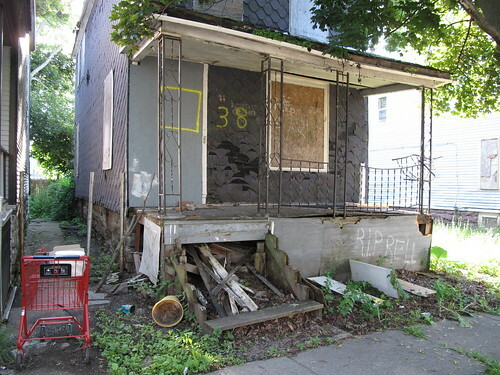 The Woodlawn Row Houses are a familiar sight to fixBuffalo readers. In part and because of the historic local landmark designation, I was inspired to start blogging about my neighborhood. While the roof is still good and the row is boarded and secure there a number of porch roof supports that have recently failed. The City of Buffalo still owns the row. 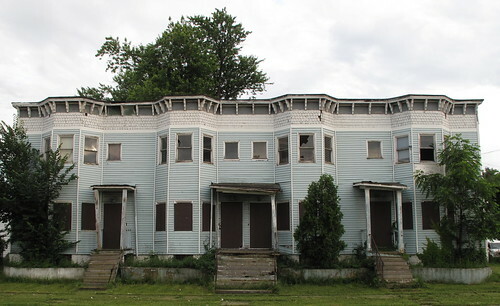 If you're interested in taking a closer look at the Woodlawn Row Houses and exploring the opportunity for an amazing renovation project, please contact me.